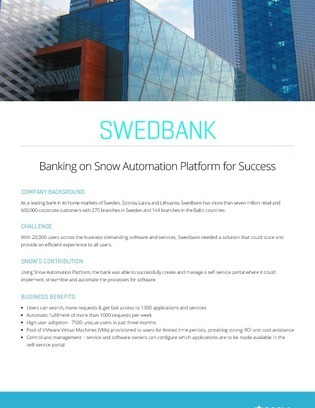 With 20,000 users across their business demanding software and services, Swedbank needed a way to empower them to download and use software quickly without having to rely on the helpdesk time and time again. This case study explores how they created a self-service portal with built-in approval processes to alleviate pressures on the helpdesk and IT team. Find out how they improved the speed at which users could access software and services while maintaining control of the approval and fulfillment processes.